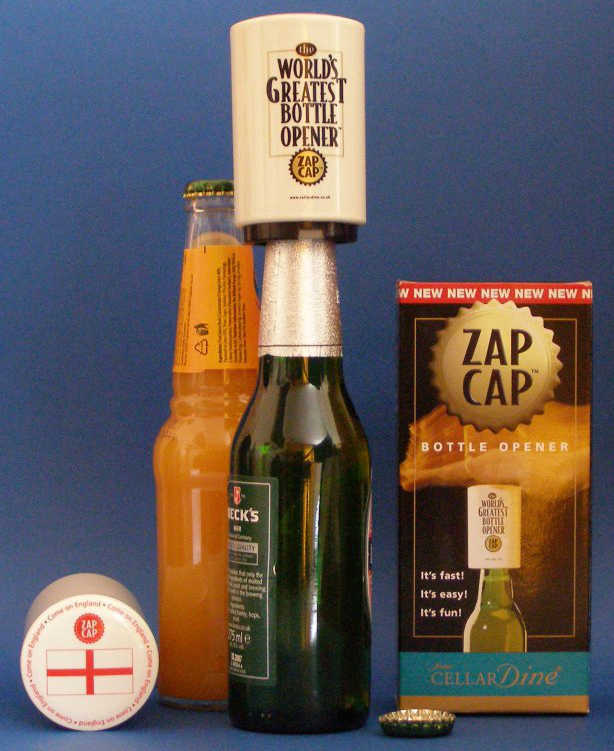 England zap cap is a limited edition of the said to be best bottle opener in the world. Now you can cheer on the England team while saying cheers with a Zap Cap opened beer. You take a crown cap bottle, flick over the bottle neck, and the cap flies off to be caught by a magnet. It is a very cool bar tool you will enjoy and use for years after sports fever has subsided. We can`t say the same about other souvenirs out there. Sure you will drink to that. England Zap Cap is meant just for the United Kingdom, but we are happy to send out this collectable to Anglophiles anywhere. It is sure to make an interesting conversation point over a few beers. England Zap Cap text, images and video are copyright.